Remember your first real apartment as an adult? You knew enough to buy the furniture because obviously you needed someplace to sit and sleep, but the walls were often neglected or at best held one singular print bought at Z Galerie. For many people even as they got older and acquired more furniture – a real dining room table! – the wall decor still suffered. 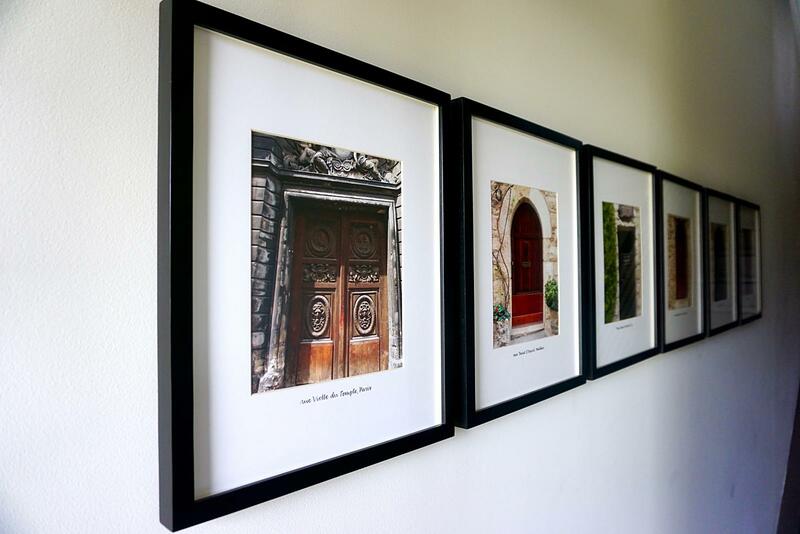 If you are that person and you are at a loss about how to decorate your walls, I have some creative ideas for you that don’t require much work or money, but bring personality and soul to your home. Why keep those travel photos on your computer? Putting them on the wall not only decorates your home but brings you joy every time pass that photo and think of that great vacation. 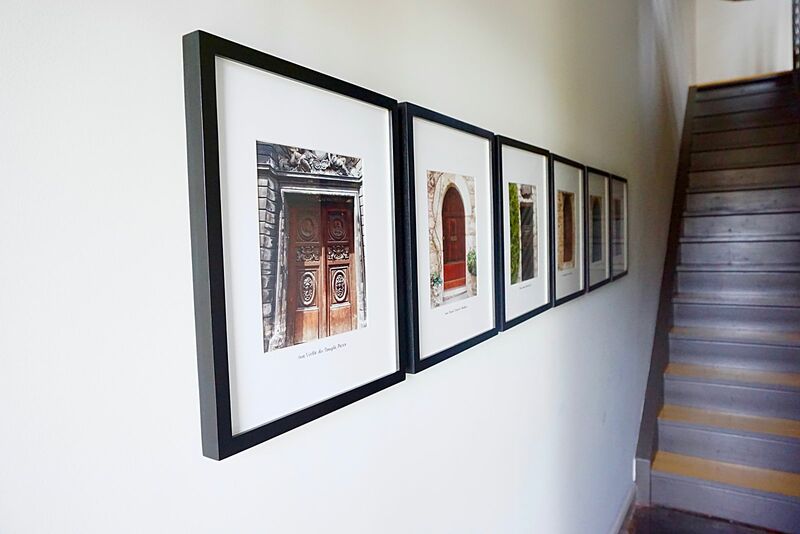 By using a quality printer like Mpix and gallery photo frames and mats like the ones I use from Pottery Barn, your photos are elevated from snapshots to art. 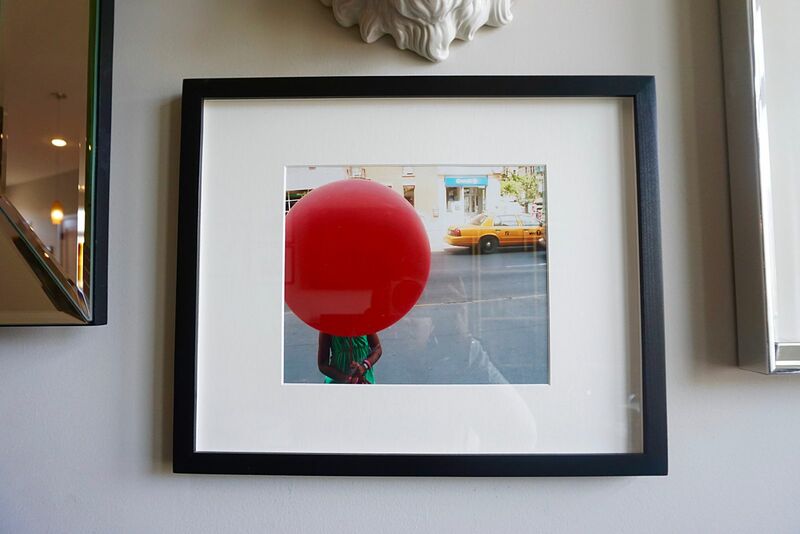 Landscapes are of course popular travel scenes and I have some nice framed photos of the South of France, but I also have some more unconventional travel photos that are always conversation pieces when guests enter my home. In the foyer is my collection of French doors. Grouped together they create quite an impact, but I took the idea even further – I hired a calligrapher to write the address of each door on the mat. I think this personal touch makes a huge difference. Another creative idea I had is to create a collage of travel food in my kitchen. These are photos that I had posted on Instagram, but I thought it would be fun to make the Instagram feed come to life. Most of these were taken with my iPhone, but since they are only printed 4×4 (Instagram size) the photos are still crisp. This is one of favorite photos, taken in Manhattan during a particularly special day. It tells the story of that day. To get photos like this try different angles and perspectives or filling the entire frame. Try to capture a moment in time in an artsy and interesting way. This photo is part of an art gallery wall in my living room. 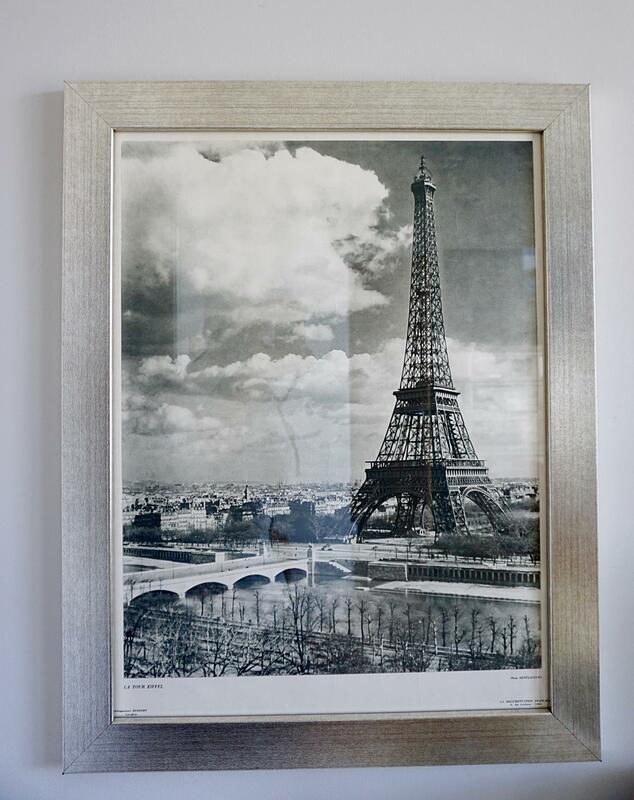 I bought this print at a Paris flea market. It’s both a reminder of my favorite place in the world and also of that day; I negotiated the price for the poster in French and I was pretty proud of myself. 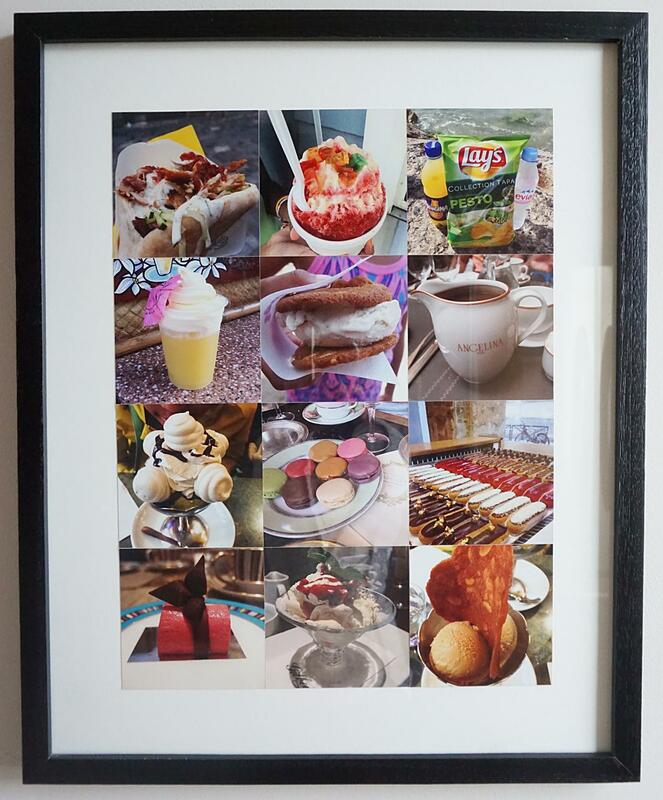 The print was inexpensive, about $20 euros, and I bought the frame for $25 in the discount section at Sam Flax. You can scour garage sales, flea markets and vintage stores for prints and posters that you like and buy an inexpensive frame at your local art store. This hangs in my bedroom over my nightstand and I love it. You can’t display it all, but if some art pieces are particularly good, they can make for interesting wall decor. 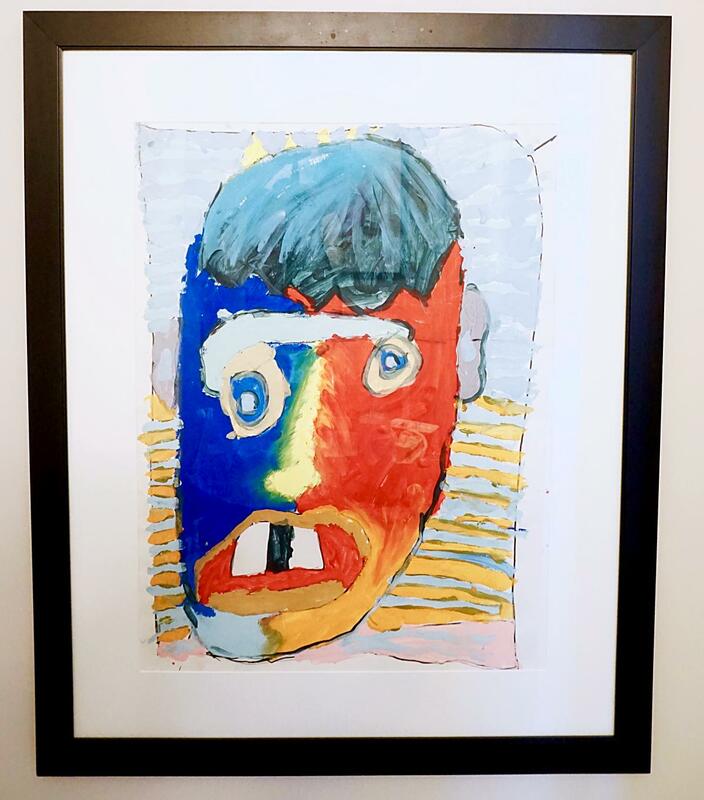 My son is no great artist, but there two paintings that he has done that I had framed. 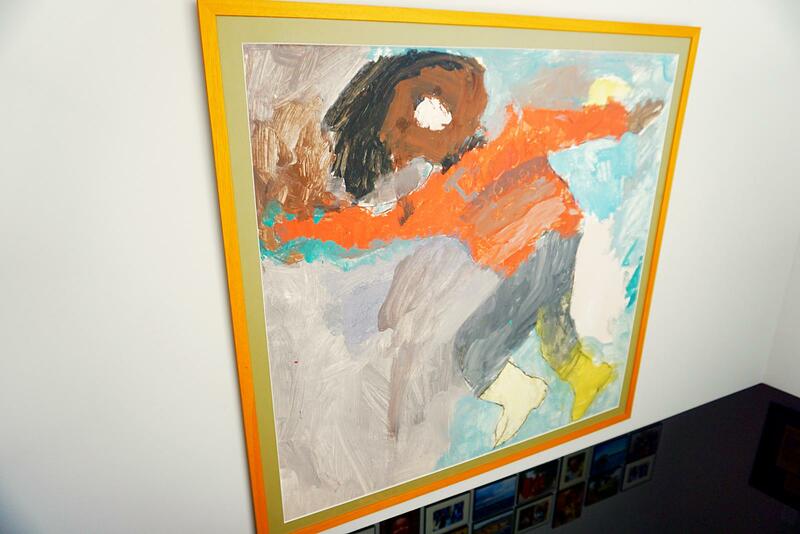 The first one is a self portrait that he painted at age 4 that I had professionally matted and framed. It’s pretty big and makes quite a statement on an awkward piece of wall in a stairway. The other one is framed in an inexpensive standard frame from Sam Flax. This painting was a school assignment; it’s just whimsical and fun. My daughter named him Bob Johnson and he lives in our powder room. My daughter is the real artist and just created a really spectacular painting that I need to get framed. So as you can see it’s not that difficult to decorate your walls creatively and with personality; anyone can do it. You’ve got the ideas now get to work! P.S. You may also like to read more posts about decorating. 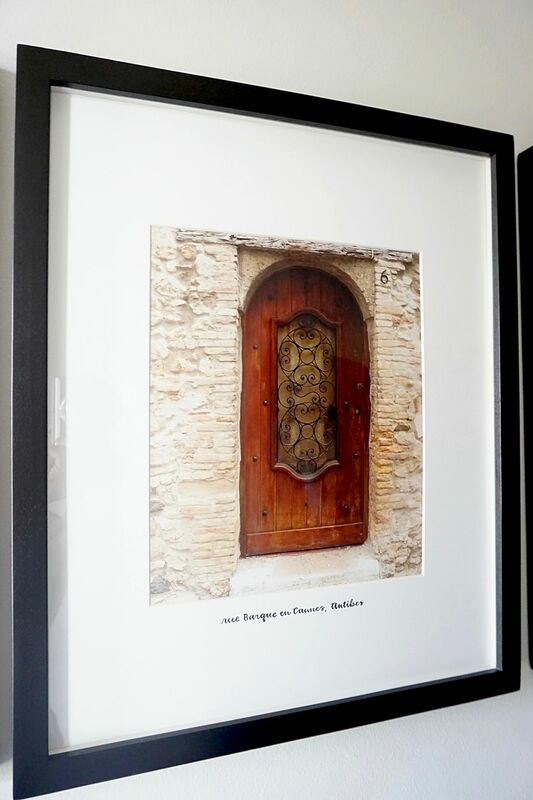 Love the photos of French doors and food collage art. That’s really cool. These are great ideas. I definitely think I need to use better frames. I’ve done the ‘bring the photos to life” thing. I found a silver letter “S” at Kirkland’s, took some photos of our cat, and put them in silver frames around the letter. It turned out pretty cool. Right below it, there’s a wooden sign that I pained that says “The cat rules, we just live here. : Or something like that. LOL There’s not enough wall space in our little apartment to hang all the art/photos we want to. Maybe once we buy something more permanent. 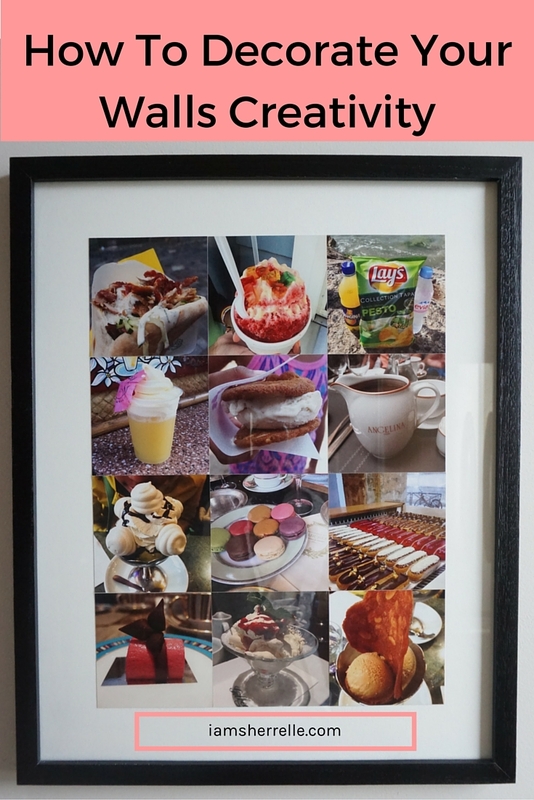 Making a collage of travel food! What a fun idea!